The 3-wire auxiliary insert is used to control System 2000 presence detectors and automatic control switches as an active auxiliary unit. In addition to the neutral conductor connection N, this auxiliary insert requires the same phase L as the power section. 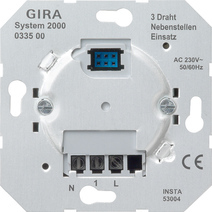 Up to 5 auxiliary inserts can be connected to a System 2000 universal dimming insert. Up to 10 auxiliary inserts can be connected to a System 2000 universal dimming insert.